I have 10 weeks old Australian Shepherd puppy and she is peeing all over my house! We are doing crate training and it worked for couple of days but now she is all over the place. Is there way to fix this? we have a 4.5 month old Aussie that refuses to cooperate with potty training. We take her out every 30 minutes and she will potty then come back in the house and pee again. Had her cleared by the vet for medical issues....it's behavioral. Be sure to rule out medical issues first. Today we purchased doggy diapers and are putting them in her in between potty trips outside. The vet also recommended rolling up a newspaper and every time she potties inside smack the paper on our hands to make a loud noise then a firm "no", and take her outside to finish. I have a male Aussie that is now 7 years old. His first two months with us were much as you have described. When we were about to give up hope, he went to the door whined to be let out and has never had an 'accident' since. It was like a light bulb went off in his head and he suddenly realized that this was the proper behavior. In house training some Aussies, patience is truly a virtue. Good luck they are worth the time and trouble. She's only 10 weeks old! It takes time! Take her out frequently and every time she does go, reward her and say something like, "good pee outside!" The best thing is to catch her in the act and quickly grab her, take her out, and say, "pee outside". DO NOT tell her she's bad/discipline her harshly for going. She'll think she's not supposed to go anywhere/any time. She'll get there. But your bed or couch may suffer a few accidents on the way. Oh well. I know it's frustrating but I wouldn't be worried that she hasn't gotten it yet - 10 weeks old is still pretty young. She'll get it. What are you using to clean the spots? If you're using anything that has ammonia in it you might be attracting Yomi right back to "go" there more. Try an enzymatic cleaner. There are lots on the market but the two that I've used are NokOut and Odormute. I can't vouch for any of the ones you can buy in pet stores (maybe someone else here can). NokOut is easier to use because the Odormute comes in powder form that you mix with water to activate (then the solutions needs to be used within 24 hours - but you can mix up a small amount). I like both. She'll get it. Just keep taking her out often, praise her when she "goes" outside and tell her "no", pick her up and take her outside when she starts to "go" in the house. Whatever you do, don't rub her nose in her accidents. That will teach her early to eat poop, and roll in it....biggest mistake I've made. If she defecates or urinates in the house, say a loud and firm NO, then take her outside IMMEDIATELY afterwards. It seems gross, but if she poops or pee's in the house, take some of it, and put it outside in the desired potty spot. She will smell it, and after a little bit, she will know where her business belongs. Reward her with a treat or some luv if she goes potty outside! :) But be patient, it can take time, but its totally worth it. I take the pup outside as much as possible. No accidents. After a nap - out. After playing - out. First couple days it was every hour. Even in the rain. Sure accidents in the crate will happen after a few hours. Keep them outside as much as possible. 10 weeks is very young. They are babies. While it is tiring you must take them out every hour, after meals, after play. During the night I got up and took her out every 2 hrs added an hour every week. Crate training and keeping her with you or in sight anytime they are out of crate. YOU control the environment. We also got a wind chime hung it on a base and taught ours to ring the bell goes outside and potty. Only took a few times for her to get it. However they do not have full control until 6-8 months. Ours did not have full run of the house until she was a year old. My husband was retired so that helped. She was never out of sight when out of her crate. She will be 2 next month and has never chewed anything in the house. She has "her" toys and knows what's ours. They are extremely intelligent and strong willed. Expect some accidents but have patients. They get it. Thank you so much for all your help and comments. It really helped alot. My puppy is still learning but getting better. Now she can hold it for 3 hours or so..... without peeing. When she gets excited or scared, she pees little bit. I guess that's normal for a puppy. Other then that she is doing great! I potty trained my aussie. If Tribble barks WAKE UP! Believe it or not it worked! I woke up and took her out to go potty. I did have a few accidents but don't we all? She normally needed to poop at least once during the night and she needed to pee about 6 times! About every 2-2 1/2 hours! As she got older she could hold it longer and now (If she didn't have to tend to 8 puppies) she needs to go at about 6 a.m. and she doesn't need to be tied to my bed. I also trained her to go on command. Every time she was looking for the perfect place take a pee. I told her the designated command and when she was done I rewarded her. During the day, I would try to watch your dog and when she seems to hang out by the door, or sniff the floor where there shouldn't be food, or walk kind of stiff-legged take her outside and give her the command you have chosen. My puppy never got the run of the house until he was 100% potty trained as well as trained to not chew things that were not his. Every hour I would take him outside on a leash. Once he went I would praise him and then let him off leash in my fenced yard a bit or I would let him play in a puppy proof room that I could watch him in. He had free play for about a half hour and then he was either put in his crate or tide next to me on a short leash for another half hour or for as long as I thought he could hold it. If I couldn't watch him he went in his crate. If I brought him out and he didn't go I brought him back inside and either crated him or tethered him next to me and tried again in a half hour. He was potty trained and chew toy trained quickly. My aussie just turned 4 months old yesterday when we got her she needs to be house broken and he jumps ALOT and bites his leash and he keeps trying to mate with my other dog. We lucked out. Ours was trained in two days. She is now 4 and never had an accident until we moved to a new house. Apparently the old owners had a dog that peed everywhere bee got new carpet in junking that would fix it. We thought it did but just found two pew spots in the house........Grrrt! 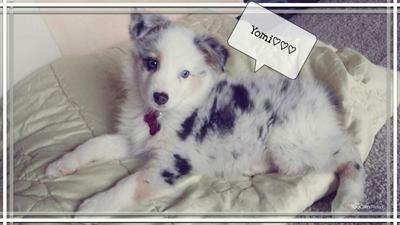 My toy Aussie is 3 months old. Would go outside every time I took him out. Now he won't. I take him out then bring him in he poops and pees. Should I crate him during the day while at work and should the crate be small. He now will poop and pee in the crate. I'm trying not to get frustrated. Can someone tell me if there may be something wrong with me—or this dog?? He is 8 months old and still peeing in the house. We have done everything since day 1—crate trained, puppy pads, outside trips every hour or two. He can hold it 9 hours overnight. I am at my wit’s end and will not continue to have an animal ruin my home. What can I do before he goes back to the Amish farm he came from? Thanks. My smart as a whip femalenisnherring worse with her potty training as she gets older. Just when I thought she was "getting it" she’ll pee and poop her crate, right after going outside, sneak off and poop on the area rug, and pretty much pee at will. At first I thought going potty in the crate was a form of manipulation to ensure she’d be let out right away, but I’m honestly out of ideas. She can sit, lay down, give both paws, roll over - she’s smart!! I use enzyme cleaner ever time. My last option is buying a bell at the door, and doggy diapers. I’ve done all the proper scheduling suggestions, and I know it’s behavioral. One thing to note is we have a 7 year old male who is uncrated. They get along and she is tenacious with him, giving it right back. They run and play together and wrestle. At wit’s end. Oh, one last thing. I have taken the "calm approach" when she makes in the house, raising my voice a little saying "no pee inside !" Then I take her out, but I think perhaps I need to be more stern and frighten her more(?). She seems very alpha and very much a tough cookie. Any help would be appreciated. They love to pee and poop inside, she’d like crazy. Was told this particular dog was potty trained as I volunteered to "pet sit" for a few days... This isn’t a puppy. Probably 6 years old. She wants to go out all the time, and won’t go pee or poop outside, has zero interest in going to the bathroom outside. She comes in, and goes on the floor... I don’t believe this breed was meant to be inside, or is easily potty trained. And, the shedding is awful. : /.